Designer Rakhi Thali (Thali Size 7 to 8 inch.) with Rasgulla 1 Kg and 200 Gms. (Gross Weight) Soan Papdi from Haldiram and 2 Rakhi, Roli Tilak and Chawal. Designer Rakhi Thali (Thali Size 7 to 8 inch.) with Rasgulla 1 Kg and 200 Gms. (Gross Weight) Soan Papdi from Haldiram and 4 Rakhi, Roli Tilak and Chawal. 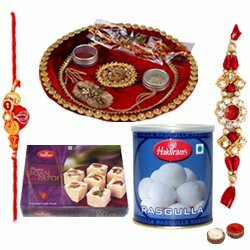 Designer Rakhi Thali (Thali Size 7 to 8 inch.) with Rasgulla 1 Kg and 400 Gms. (Gross Weight) Soan Papdi from Haldiram and 1 Rakhi, Roli Tilak and Chawal. Designer Rakhi Thali (Thali Size 7 to 8 inch.) with Rasgulla 1 Kg and 400 Gms. (Gross Weight) Soan Papdi from Haldiram and 2 Rakhi, Roli Tilak and Chawal. Designer Rakhi Thali (Thali Size 7 to 8 inch.) with Rasgulla 1 Kg and 400 Gms. (Gross Weight) Soan Papdi from Haldiram and 4 Rakhi, Roli Tilak and Chawal.